참 현실성 없죠? 그럼 이건 어떤가요? 파리를 순환하는 열차 노선상에 컨테이너를 이용한 이동형 무한 반복 괘도 주행 샵입니다. 허허 참...2호선상에 이런 샵들을 갖춘 10량 정도의 열차에 도심 순환 퀵 택배 서비스 까지 접목 시킨다면 나름대로 광고 효과와 효율면에서 엄청나게 좋지는 않을까요? 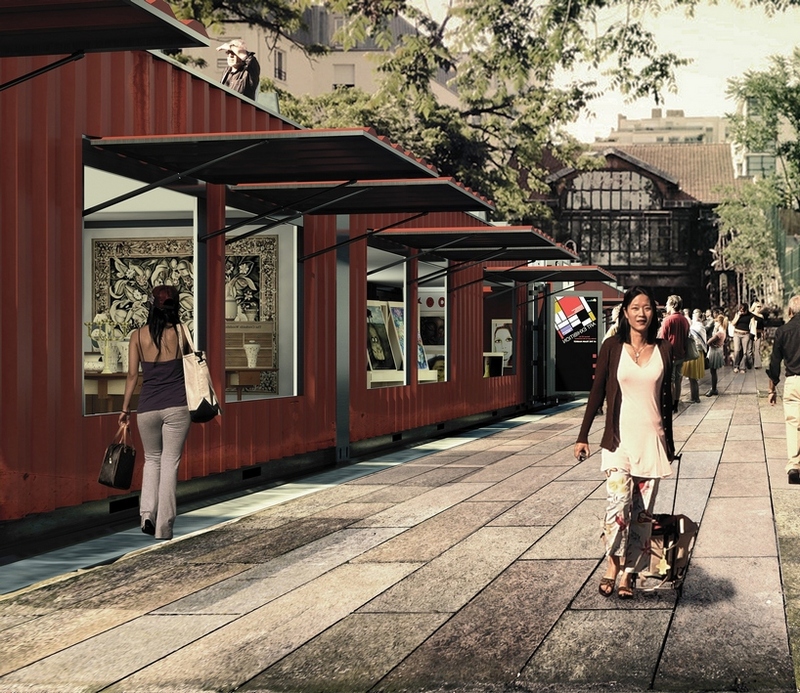 amílcar ferreira and marcelo fernandes have proposed converting abandoned train lines into an itinerant market. 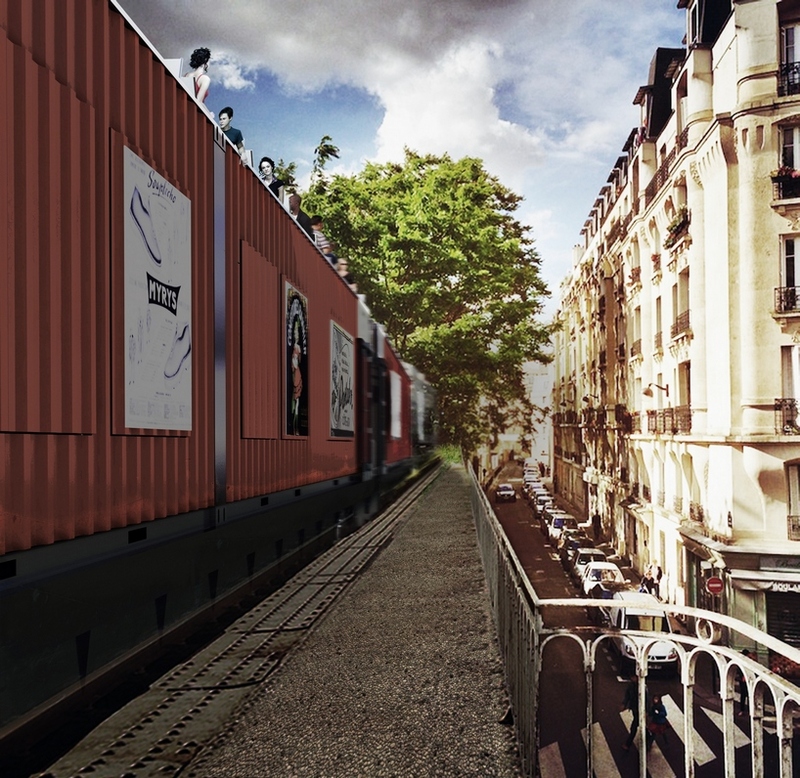 submitted as part of an m.art opengap competition, the ‘petite ceinture’ railroad in paris was used as an example for the traveling design. 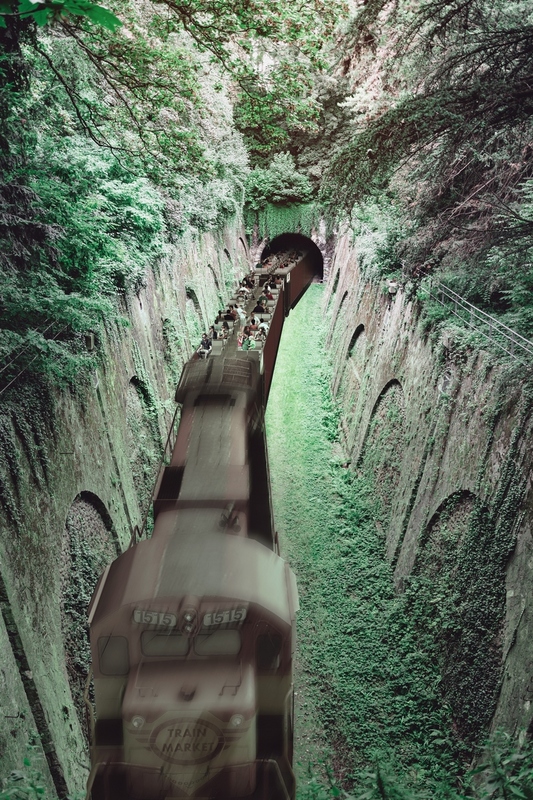 the project brings back to life preexisting transport networks that are in a state of disrepair, giving them a purpose again. once fundamental to the distribution of goods and people throughout the cities, these structures have, during modern times, succumbed to the emergence of new metro lines and exponential population growth. 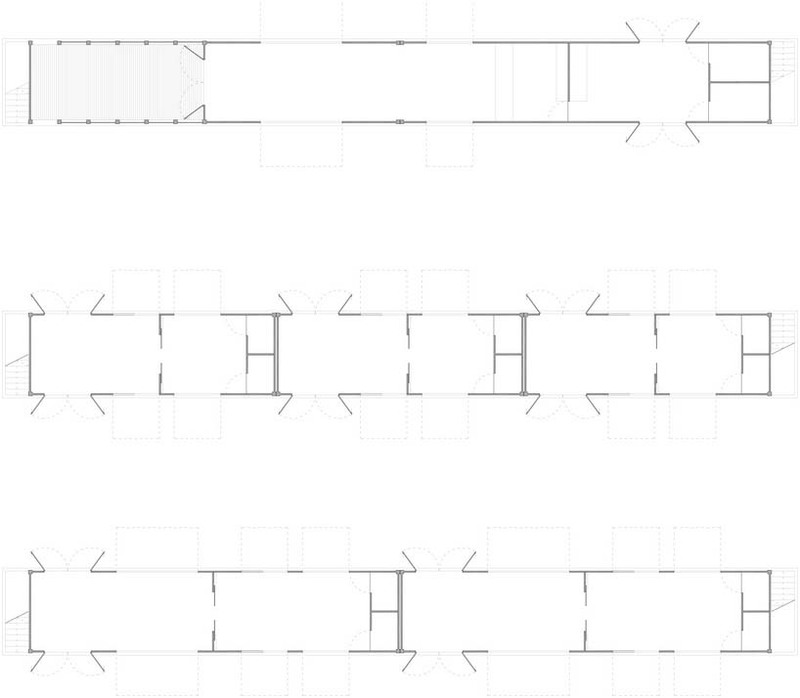 the systems however, penetrate deep within the city, offering a connection to compact neighborhoods through the core of urban mesh. envisioning a less pollutant, self-sufficient market, the design produces and distributes its goods in an environmentally sustainable way. paris has one of the highest population densities, yet it still offers a wide array of antiques and other traditional markets. every day there are dozens of markets spread around the city with parked vans blocking the bicycle paths, metal structures being pitched leaving garbage piled after their dismantlement. 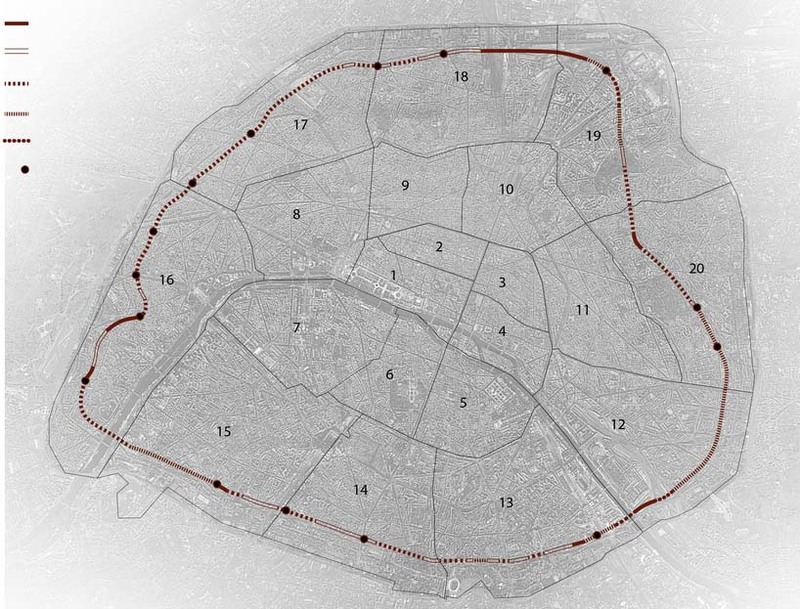 wanting to resolve the amount of waste produced by these structures, the designers proposal for the rehabilitation of existing infrastructures enables the market to stop in the core of the city without disrupting other aspects of the urban life. the train houses the workshops/stores and necessary services, and, while on the move, visitors can take a ride in it, promoting not only the market itself, but also interaction between residents and tourists.